British Airways has upped the ante in the most recent Airline vs. Passenger challenge when they kicked off two passengers after an argument ensued when a man tried to self upgrade to Business Class. 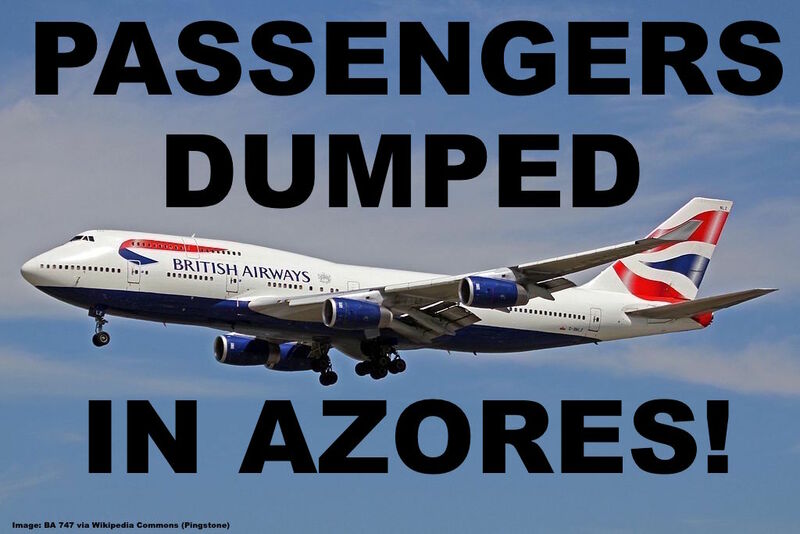 The flight was en route from London to Jamaica and stopped on the remote island of Terceira in the Azores (Portugal) where the passengers remain until now. The situation escalated when one passenger started to move himself to Business Class one hour into the flight while complaining about health issues. It has meanwhile been reported that the man suffers from cancer and diabetes even though none of these factors are an excuse for what happened here. A woman who was not traveling with the man was also kicked off the flight after it landed at Lajes Field in the Azores after she objected to the rough treatment of the passenger by the cabin crew. The Daily Mail (access here) had some rather sensational reports about this. Kwame Bantu, 65, was an hour into the 14-hour flight to visit family in Jamaica when he began to feel dizzy and saw his leg swelling. He then tried to move into business class, where he says he was ‘ambushed’ by six members of staff who tied him up by his hands and feet before allegedly dragging him back to his seat in economy. It was initially reported that Mr Bantu, who is still stranded on the remote island of Terceira, was kicked off the jet for refusing to leave the business class section. The entrepreneur, who was wrongly reported as being Mr Bantu’s partner, told MailOnline how stewards told him to ‘defecate in his seat’ when he told them he needed the toilet. British Airways told MailOnline that Mr Bantu refused to move from business class and verbally abused crew, so they ‘helped him walk back to his original seat’. Neither of the passengers know where their baggage is or how they are to get home. Despite the fact that London to Kingston a 9:45h flight and not 14 hours as described in the article this entire situation makes very little sense. The Aircraft has also returned to London-Gatwick after they dropped off the two passengers, inconveniencing hundreds of people and bringing a huge financial burden upon themselves, only for the sake of showing a self-upgrader who is boss? A passenger has to remain in his ticketed cabin and isn’t free to move to other sections of the plane unless the inflight manager decides that it is appropriate. This could also include moving a passenger for medical reasons but this usually happens after a doctor on board is consulted, not because a passenger says he needs to stretch out his legs. If this situation occurred one hour into the flight why did it take the crew that long to decide to stop and offload the passenger? Furthermore, is excessive violence and degrading behavior from the crew really warranted in such situations? Especially when other passengers already feel the need to object. Here is a scene of the police coming on board to take the man off the flight at Lajes field. 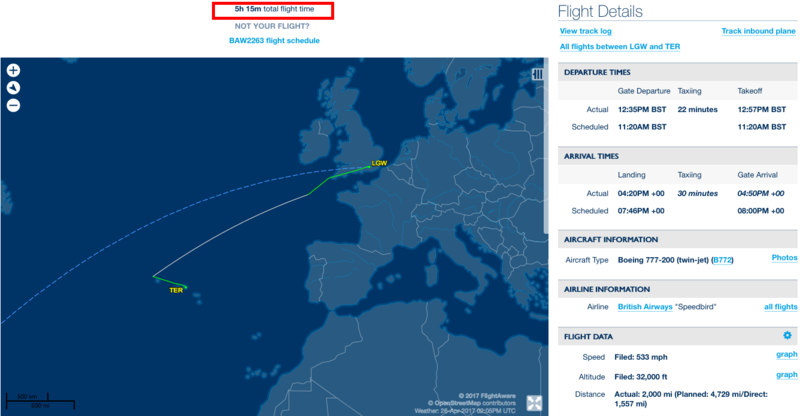 Let’s have a look at the movements of the flight via Flightaware to get a feel for the geographic of where the Azores are which is where the passengers were eventually dumped by BA. The flight was 5:15h in the air before landing at Terceira. If the initial incident took place 1 hour into the flight what happened during the remaining 4 hours? Why not return to the UK, Ireland, Spain or Mainland Portugal? Not sure if dumping passengers on a remote island is really the way to go here. British Airways has made headlines before for excessive actions against passengers they accused to be violent, drunk or disobedient such as the woman who received a lifetime ban on her way to Dubai (we wrote about it here last year). Is British Airways having an issue with misjudging and properly deescalating situations like these? Telling a passenger to defecate in his seat in an occupied passenger cabin is certainly not a sensible response from a crew member and provides ample group to rile up other passengers as well. If a crew member would tell a passenger next to me to take a dump on his seat I’d go bananas for sure, this much I can tell you. This is a very odd situation and the inconclusive accounts as far as the time is concerned isn’t helping to clear the matter up. I wonder if there are more videos shot by other passengers will come out to shine more light on this. The passenger was clearly at fault by moving into a cabin he wasn’t ticketed in but there are other ways to solve this than to escalate the situation into a dangerous confrontation. British Airways has all the data necessary to send the passenger a bill for the fare difference back home. Lufthansa for example is known for resorting to this measure which is certainly more effective than engaging in a fight with a passenger and diverting the flight.